hello wild olive friends and fans! i am so excited to be here today to help mollie celebrate. (thank you so much for inviting me to your party!) i love a good party and, in my opinion, a good party makes you feel special. i don't always have the time or energy to plan out all of the little details, but just a few personal touches can make the smallest event memorable. dress up your food. whether you get a take-out pizza, make a cake from a box mix, or heat up frozen appetizers, everything looks nicer on pretty plates. thrift shops and garage sales are great sources for affordable serving pieces. better yet, borrow from friends and family. and remember, things don't need to match, just coordinate. take photos. set up an easy photo booth with a flat sheet hung over a bookshelf or on the wall. take a few minutes to capture some fun shots of your guests. as much as we all love candids, this is a great way to make sure you get a photo of everybody. make a banner! i love personalizing parties with a banner. i wrote up an easy tutorial last year that works well for this. or if you can invest in a set of alphabet stamps, they quickly transform punched or cut paper into something sweet and special. my biggest tip? a good party is more about the guests than anything else. hospitality is more concerned with a welcoming atmosphere than a perfect menu or beautiful table setting. if the planning gets in the way of this, you need to scale back. there are so many simple ways to transform a gathering of loved ones to something special. what are some of your favorites? 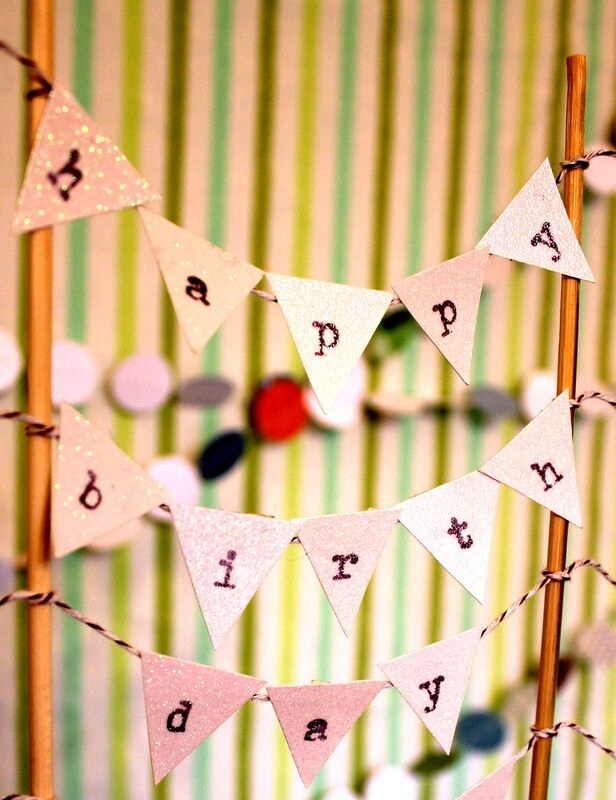 share your party tips in the comments and enter to win a personalized birthday banner of your own from my shoppe. (because i am a fan of a good party favor too.) the giveaway will remain open until sunday night, and we'll announce the random winner on monday. happy birthday mollie! i hope it is a wonderful day that makes you feel special and loved! Thank you so much, Annalea! I love all of your ideas, and I truly appreciate that in the midst of being a busy mom you took time out for the party! Decorate a day or two ahead of the party. Saves you a lot of stress! Remember that everything doesn't have to be perfect and ask for help if you need it!!! a good party is really about the people and especially the person you are celebrating. Party tip: have someone else besides yourself (the host) take photos in case you get too busy and forget t document the event. Second tip: just serving cake/cupcakes & ice cream is a party in itself!! Give your table dimension by putting boxes (or I used old hard suitcases) under a table cloth and put food at different heights. It is a cheap trick to make everything look fancier or at least more fun. I agree with Nicole... having someone else be in charge of taking the photos frees you up to take care all of the other details. Keeping things simple and making organized lists of everything that you need done really helps as well! I hate to be so unoriginal, but I would definitely say have someone else take pictures for you! I love taking pictures but find myself often missing great shots because I'm in the middle of something. Also, having someone keep a list of gifts and who they are from is a great idea. I can never remember who gives what. Keep the party to close friends and family! Makes it way more enjoyable and not so overwhelming! You're surrounded by people that LOVE you! For kids parties, try to honor the birthday boy's/girl's wishes even if you're not crazy about their ideas. Last year my son wanted a dinosaur playing a drum for his cake, and even though I had other ideas in mind we made it work, and he was so happy! my favorites for parties: a playlist of catchy tunes played low, non-posed black and white photos of the action, and fresh flowers. but more than anything, I've found this to be the most important: go deep in conversations with people. despite the initial awkwardness, it's worth it. i love making things for the guests to take home as a reminder of the fun we had together. nothing fancy, just something handmade and full of love, but it always help me stay focused on the fun of the event instead of stressing over other details. My daughter's first birthday party today - and my tip is decorate simply and colourfully! A little goes a long way when there's colour. i love keeping things simple. from who is invited, to what is served, to the gifts. having the "less is more" mentality helps me focus on making the simple things extra special. I just LOVE homemade birthday cakes. They don't need to be fancy, but I think it's a really fun personal touch! something my friend with 4 boys does at b-day parties is to have the brothers help out and get involved: her youngest son had a dora/diego party this month and the guests when on an 'adventure'. The older brothers played roles such as Swiper the Fox who stole the pinata and another who was a 'tour guide' I loved how the siblings were involved! My tip? Serve food interactively! Make your own pizzas for adults (hostess/host cooks 'em), build your own stir fry (again, hostess/host cooks it) and even children can frost and decorate their own cupcakes or cookies. Gives everyone something fun to do and allows folks to have their food just the way they like it! is it too late to try to win the birthday banner!?!??? I <3 it and my (turning) one year old daughter does too!!!! !